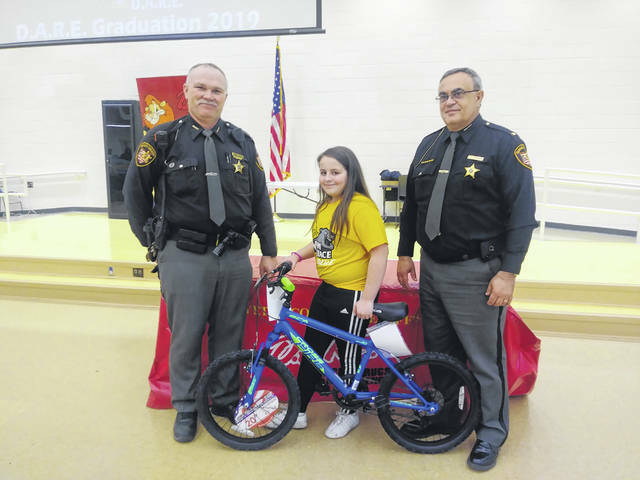 Miami Trace Elementary School celebrated its fifth graders’ graduation from the D.A.R.E. program on Wednesday. Fayette County Sheriff’s Office Deputy Monty Coe, their D.A.R.E. officer, and Sheriff Vernon Stanforth are pictured with first-place essay winner, Gabby Matthews. https://www.recordherald.com/wp-content/uploads/sites/27/2019/03/web1_20190320_133949.jpgMiami Trace Elementary School celebrated its fifth graders’ graduation from the D.A.R.E. program on Wednesday. Fayette County Sheriff’s Office Deputy Monty Coe, their D.A.R.E. officer, and Sheriff Vernon Stanforth are pictured with first-place essay winner, Gabby Matthews.